Welcome to Day Twelve of Fiction University’s At-Home Workshop: Idea to Novel in 31 Days. The first twelve days will focus on developing the story and getting all the pieces in place so we can more easily plot the entire novel. Today, we’re looking at setting. Where a novel takes place is just as important as who’s in it, because the setting can help determine what inherent problems (conflicts) the characters will face. Challenges in Manhattan are different from those in Montana, and neither come close to the challenges of living on a small moon off Jupiter. So even if we’re writing about a gal from Ipanema, setting plays a big role. A novel about isolation might work best in the middle of nowhere, or it might play off contrasts and be set it in the biggest city in the world. A novel about a character with a troubled past could work well somewhere where that past can do the most damage if revealed, or a location that also has a troubled past to layer the theme and character arcs and tie it all together. Why the setting is important: Setting not only gives readers a world to lose themselves in, it allows us to craft elements that can enhance the novel. Where something occurs can strengthen mood or atmosphere and trigger the emotions we want readers to feel. 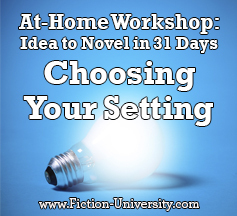 Also consider the scope of your setting and how it relates to your novel. Maybe you want a small town, or just a small room. You might want a novel that spreads across continents or galaxies. Big cities offer things rural towns don’t and vice versa. Even if your setting is your own creation, you have options on how metropolitan it will be. A setting feels differently to someone who’s lived there her whole life versus a newcomer. You might want the protagonist and the reader to feel like a newcomer, or you might choose to set the novel in your hometown. Familiarity could bring unexpected details, while a new locale could capture your attention as well as your reader’s. Wherever you set your novel, try to pick a place that will enhance the story and add depth to your characters and theme. The more real a setting feels, the more immersive it can be for the reader. 1. Where are your favorite places? List five locations you love. 2. What mood or atmosphere do you want the novel to have? Write down the dominant mood of your novel. 3. What settings are common to your genre? List five favorite settings common to your genre. 4. What location would enhance the novel’s conflict and/or theme? 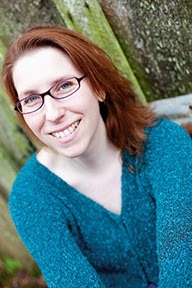 List five locations that enhance your novel’s conflict. Do the same for the theme. Are any of them the same location? 5. Do you want a real or fictional location? Write down which type of location you prefer. 6. Is it a small or large scale location? Write down the scale of your setting. 7. Do you want an urban or rural area? Write down which type of area you prefer. 8. Does the protagonist know this place or is she new to it? Write down how well the protagonist knows your setting. 9. Do you want a setting you’re familiar with or something you’d need to research? List five familiar settings you think might work for your novel. List five more that you’ve always wanted to visit. EXERCISE: Describe your setting and why you choose it. If you have more than one, describe all the important locations you might need. Don’t worry if you’re not sure, as more locations will no doubt occur as the novel unfolds. Focus on the general sense of the place or world as well. As a fun extra, try to explain why you chose this setting and what you feel it can add to the novel. Those following along with the PYN book: Workshop Four goes into more detail on choosing a setting. 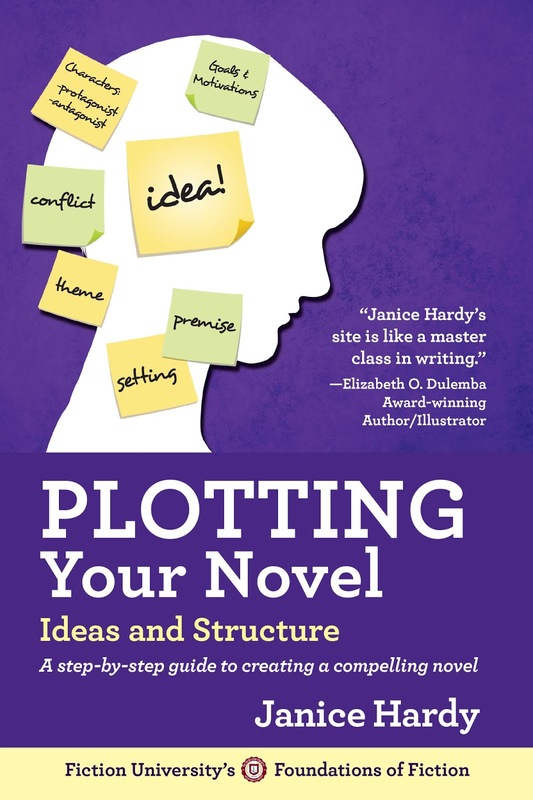 Tomorrow, we’ll start working on the plot and look at developing the goals of your novel. One rule of thumb I use about many a setting: I try to personify it in terms of what uses the place's designer had in mind for it, maybe layered with who moved in later and tried applying different goals. (For a natural setting it's mostly geography vs the latter, of course.) That way I can give the reader a quick insider's sense of the Why of a place, and clear contrasts with how that does or doesn't help with what the hero needs now. Great description. That's a neat way of looking at setting. It really plays into world building.